It comes as a surprise to find that the promontory on which North Queensferry is built has been all but hollowed out by the deep, rock-sided Battery Quarry. The effect is oddly like a south sea atoll, a hollowed out ring of rock with the water filled quarry at its centre and surrounded on three sides by the Forth Estuary. What is left of the land gives just enough room for the footings of the northern end of the Forth Rail Bridge and a sprinkling of houses and cottages. 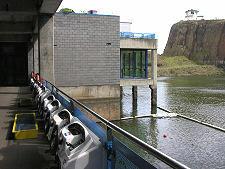 But in the early 1990s a perfect new use was found for the disused Battery Quarry, one that would help transform the fortunes of North Queensferry and turn industrial dereliction into one of Scotland's most popular tourist attractions. 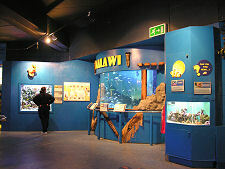 Deep Sea World opened to the public in 1994. The concept is amazing. 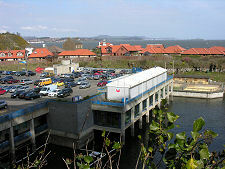 In effect, a visitor car park was built out over the northern half of the flooded quarry. For the visitor, the car park can at first sight seem all there is, as beyond its edge is simply the uncovered southern half of the flooded old quarry. 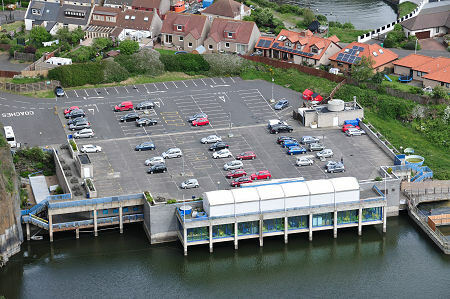 In fact, Deep Sea World's car park effectively forms the roof of the complex. From it, visitors make their way down a ramp to enter via a lower level whose glass frontage looks out over the quarry to the sheer cliffs that mark its southern edge. 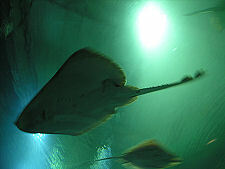 This level is home to many of Deep Sea World's attractions, but not its most spectacular and unusual one. For that you need to descend a series of further ramps to well below the water level in the surrounding quarry. 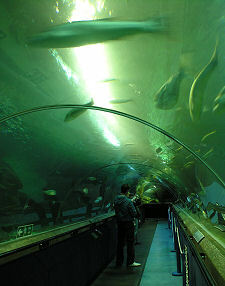 Here you find the underwater tunnel, which leads visitors through a realm they could never normally experience. Suddenly you are among the fish - perhaps not quite swimming with them - but certainly the nearest you can get to it with your clothes on. 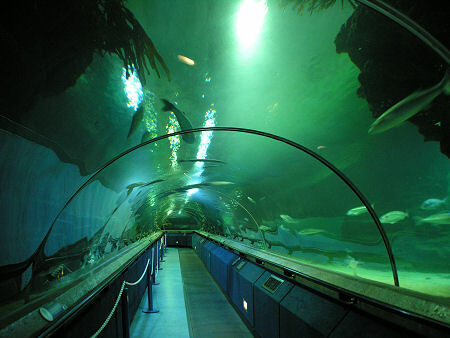 The underwater tunnel at Deep Sea World is 112m long, making it one of the longest in the world. And although 112m may not sound very much, the reality is extremely impressive and seems much longer. As you gaze around, you at first wonder whether the tunnel is somehow simply running under the covered part of the flooded quarry. Then common sense sinks in as you begin to realise that the large population of sharks and other fish swimming past your head really couldn't be allowed to swim "wild" in a flooded quarry. 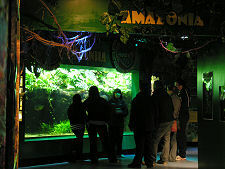 Instead, the tunnel leads through a carefully lit tank in which over a million gallons of water are home to a wide variety of species and a large number of fish. It is reassuring to discover that the acrylic the tunnel is made of is 6.5cm thick: though in some ways less so to find that its curvature makes all the fish swimming around you seem 30% smaller than they actually are. That does nothing to diminish the sense of awe you feel as you walk among Europe's largest collection of sand tiger sharks, one of the reasons why Deep Sea World calls itself Scotland's "Shark Capital", or walk past huge and hugely impressive rays, or simply enjoy all the many smaller inhabitants who, despite their size, you still find yourself looking up to. This sense of looking up at fish rather than down at them is one we very seldom have a chance to enjoy. 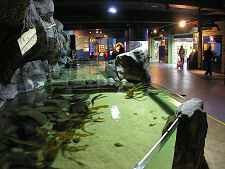 Before moving on to the attractions on offer on the main exhibition floor of the aquarium, it is worth mentioning another reason why the claim to be "Scotland's Shark Capital" seems a fair one. 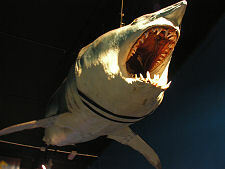 Because at Deep Sea World, you can not only walk among the sharks, you can also swim with them. OK, that's not simply something that every visitor to the aquarium can do. But if you are a qualified diver, you can book sessions to dive with sharks here, ranging from an evening dive to a full day's shark awareness course and more. There are also courses designed for absolute diving beginners or for those wanting to undertake a dive as part of a corporate awayday. Back in the world of the more casual visitor to Deep Sea World, while the highlight of the visit is almost inevitably the underwater tunnel, most of the rest of what is on offer can be found on the level immediately beneath the car park. 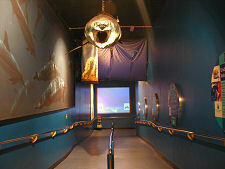 Here a series of themed areas bring you face to face with different aspects of our aquatic world. Here you can explore the rainforest, the lungs of the planet, and in Amazonia come face to face with a tank of deadly (and surprisingly large) piranha. 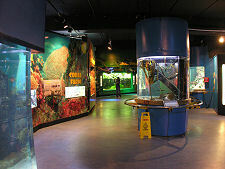 This is as good a moment as any to mention that a great deal of the interest at Deep Sea World comes from a series of events that take place on a regular basis, as different tanks are fed or as talks are given about the lives and lifestyles of different groups of inhabitants. 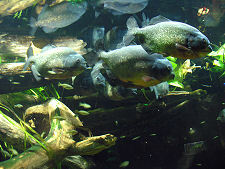 The piranhas are, apparently, fed only once a week. You get the feeling, looking at them, that this may not be an occasion for the squeamish. 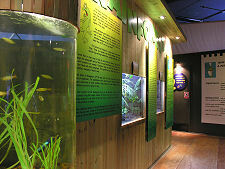 Elsewhere, events include presenters talking visitors through different aspects of life on our rocky shores, while the aquatic theme is extended as far as amphibians, with one room given over to frogs. One tank that is definitely aquatic is home to a family of pot-bellied seahorses that for all the world look like pictures of dragons in children's story books, though without the wings. 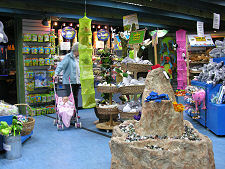 The most recent addition to Deep Sea World is the seal sanctuary, which opened in 2005. There are two pools here. 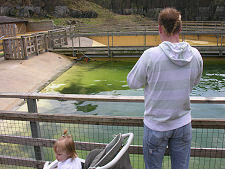 One is home to the resident seals, while the other houses up to 10 rescued or injured seal pups. Seals, wherever you encounter them, seem to gain pleasure from teasing humans by hiding away when being looked at: so checking on arrival when the seals are going to be fed is a good way of ensuring you see them at their most active and visible. 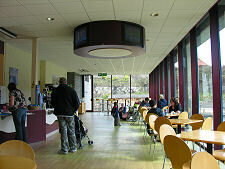 Other facilities for visitors at Deep Sea World include a large cafe with views over the flooded south half of the quarry; a lecture room; a shop; and even a facility for driving remote controlled boats from control stations located close to the main entrance. 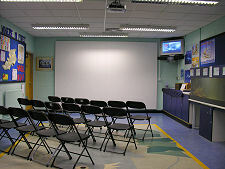 For anyone looking for something a little out of the ordinary to do in Scotland, especially if the weather is being less than friendly, you could do far worse than visit Deep Sea World.